Is your forehead hot (and not sunburned or due to being good looking)? A fever, except in very infrequent circumstances, is merely a natural response by your immune system to infection. It isn’t necessarily a bad thing. It most likely just means that your body is functioning the way it should. Now there are a few situations where a fever is something that you should worry about, like with newborns, children, and elderly people. This is especially true if the fever is accompanied by one of the symptoms from the list below. The rest of the article goes into greater detail about those situations. One major threat posed by fevers is permanent brain damage caused by a very high fever. This is called hyperpyrexia, and it happens when a fever is over 106.7º F. But you should already be at the doctor when the fever goes over 103º F. Dctors can deal with fevers quite well. At home, fevers are more of a nuisance than a threat. The key is to get rest and stay hydrated. And if reducing a child’s fever, it is absolutely necessary use ibuprofen, not aspirin. Aspirin should be avoided for children and teens because of the danger of Reye’s Syndrome. A fever in a newborn is a rectal temperature of more than 100.4º F or an underarm (axillary) temperature over 98.6º F. Doctors used to recommend taking a newborn’s temperature rectally and some might still, but call your doctor’s office to find out. Ask them for directions, if they want a rectal temperature. Otherwise, if you’re taking your newborn’s temperature on your own, try taking it under their arm. There are thermometers available for purchase that are specifically made for taking underarm temperatures in newborns and children. Otherwise, use an oral thermometer—place the thermometer in your baby’s armpit and hold their arm down with the thermometer underneath until the reading is complete. 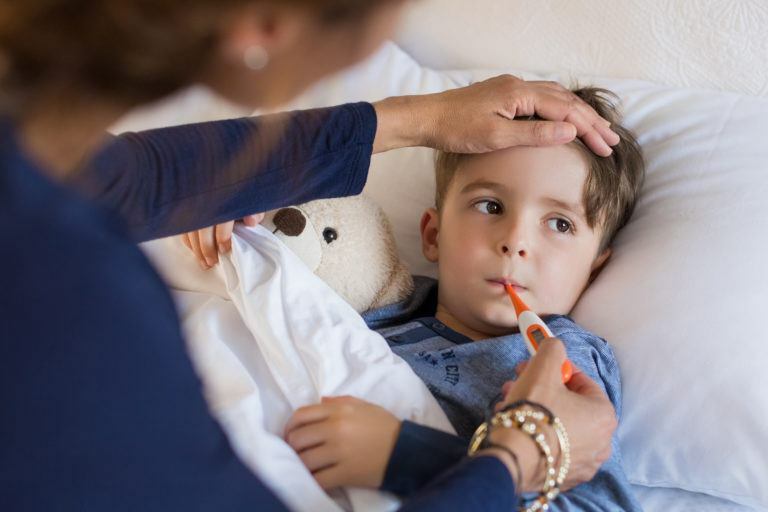 Fevers are normally caused by infection, but occasionally in newborns, especially premature infants, an infection may not be the cause of a fever. Fevers in infants and newborns should always be treated by a doctor. An oral temperature of 99.5º F or a rectal temperature of 100.4º F is considered a fever in children. Many children are capable of tolerating a fever. If the child is responsive, able to drink fluids, and wants to play, there probably isn’t anything to worry about. If the child becomes listless, has a severe headache, has persistent vomiting, or has a fever that isn’t responding to fever-reducing medication, see a doctor. Don’t use aspirin to reduce a fever. It has been linked to Reye’s syndrome. Fevers are serious business, so if you have any concerns about your child’s well-being, call your doctor. The trick is to cool the body down without causing it to get the chills or go into shock. You may have seen people with fevers get ice baths in the movies, but that’s an extreme circumstance. A more realistic approach would be to take a bath in water that is around 95º F. If the person begins to get the chills or shivers, stop the bath. Never put an infant in a cool bath. Their bodies are too small to handle the extreme temperature change. Otherwise, try a cool, wet cloth on the forehead, or an ice pack on the head, groin, or armpits. Ask a doctor what to do about a fever, and that doctor will most likely tell you to keep hydrated and get some rest. That is as long as the fever is under 103º F. If your fever gets above 103º F or if you have a fever for more than three days, see a doctor. If your fever hasn’t reached either of these levels, drink water with electrolytes in it, along with soup broth, Gatorade, Sprite, and plain water too. Just don’t drink more than a gallon of water in a day. That’s too much water. The best fever reducer is without a doubt ibuprofen, which is an NSAID, which stands for non-steroidal anti-inflammatory drugs. Other NSAIDs are naproxen sodium and ketoprofen. Aspirin and other salicylates also reduce fever but should never be taken by someone under the age of 18. Acetaminophen, or paracetamol, (brand name: Tylenol, sold at Amazon) reduces fever for some people but not all, like myself. Other drugs that reduce inflammation are metamizole, nabumetone, nimesulide, and phenazone. If you have any questions about whether or not reducing a fever is the right thing to do, read the next section. Willow bark is an ancient cure for aches and fevers. Hippocrates wrote of its medicinal properties 2,500 years ago. It was the precursor to aspirin, which eventually led to the other NSAIDs. Historically, medicinal ginger was called Jamaica ginger. Ginger is said to have anti-inflammatory effects. Much research has been done, but the jury is still out. Most people make tea from it. You can order Jamaican Ginger Tea at Amazon. When all is said and done, reducing the fever doesn’t really improve your condition. It may make you feel better but you are still ill. Try supporting your body’s immune system with lots of rest and liquids. I am not a doctor, but I think fevers should only be reduced when it is absolutely needed. A fever is your body doing what it’s supposed to do. Our immune system functions much more efficiently at a warmer temperature. And when you have an infection, you want your immune system to function as best it can. In fact, you want to support it by drinking water and taking vitamins and supplements to give your body energy and materials to fight the infection. On the other hand, a fever can be very difficult on a child and on us. And occasionally relieving a child’s fever may give the child a chance to sleep, relax, or calm down. It may also give you some reprieve from the illness. But it really should only be done when absolutely needed because suppressing our immune systems will only keep ourselves sick longer. And no one wants that.